Melissa Barton, Portland. Jennifer Rae Pierce, Vancouver. Mika Mei Jia Tan, Los Baños. Juan de Dios Morales, Guayaquil. Cities that plan for biodiversity recognize the potential of healthy ecosystems to mitigate urban problems and enhance quality of life but, due to limited capacity, can struggle with developing and managing their biodiversity strategies. Our team at the Urban Biodiversity Hub (UBHub) has compiled thousands of examples of biodiversity work from local governments and environmental NGOs around the world that can help. After two years of development, we have now publicly launched the largest public database of urban biodiversity activities worldwide. Our database is a one-stop shop that makes it easier for people to explore urban biodiversity practices and select from helpful resources. In defining the scope of the database, we use a broad definition of urban biodiversity that encompasses all activities and information related to urban nature and the influence of cities on conservation, including individual species plans, green and blue infrastructure, impact on regional landscapes and global conservation goals, environmental education, and more. Together, these data consolidate information previously scattered across hundreds of sites into one searchable location. 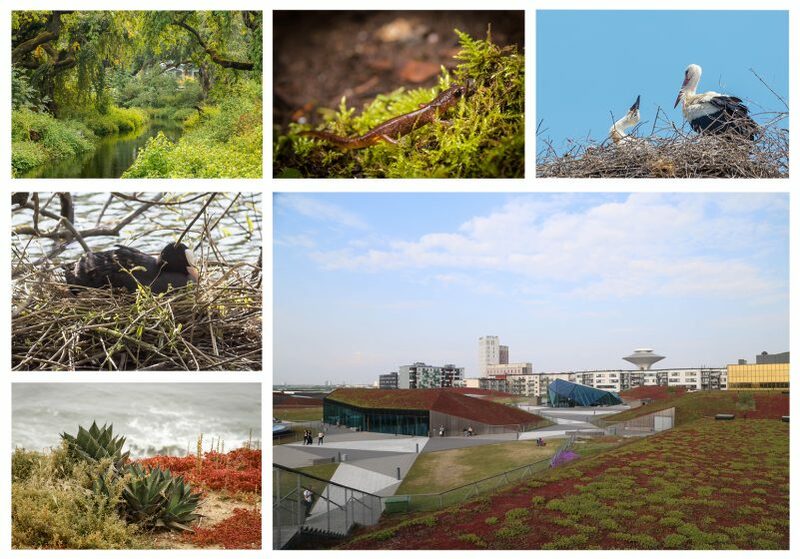 Clockwise from top left: Some examples of urban biodiversity and green infrastructure include Crystal Springs Creek, a Salmon-Safe urban stream in Portland, Oregon; an Oregon ensatina salamander from a suburban backyard; white storks nesting on a roof in Skalla Kallonis, Lesvos, Greece; an urban rooftop park on the Emporia Mall in Malmö, Sweden; some of the largest U.S. population of the endangered Shaw’s agave in Cabrillo National Monument, San Diego, California; and a Eurasian coot nesting in Copenhagen, Denmark. Photos © Melissa A. Barton. The UBHub database has two parts, now available and free to explore at www.ubhub.org: (1) an interactive map of biodiversity in practice, consisting of plans, reports and activities, and (2) a resource guide that organizes and compares tools for urban biodiversity. 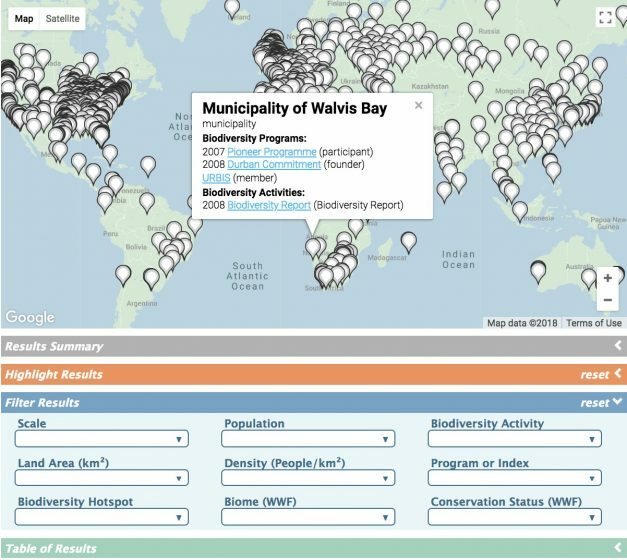 Screenshot showing the largest database of urban biodiversity activities worldwide, by the Urban Biodiversity Hub. Image from www.ubhub.org/map. The UBHub map visualizes global and regional patterns of what cities and other actors are doing to improve local biodiversity. Each of the map’s 1,200+ markers (as of October 2018) contains a list of urban biodiversity activities, documents, programs, and awards related to that location, along with links to the original sources. The data can also be filtered by city parameters to locate comparable biodiversity efforts. Markers on the map can be searched by keyword and can be highlighted by program or filtered according to several variables, including scale, population, density, biome, and conservation status. The map database is also available in a summary or in table form. The data available via the map are already proving useful for practitioners and researchers. Staff at the City of Los Angeles, in preparation for creating their own biodiversity strategy, used the UBHub map to locate other municipalities that have instituted specific programs and activities of interest. Researchers have used the database to quickly locate government documents and summarize current practices in urban biodiversity. Our team also harnessed the database to put together a summary report of current practice as contributors to The Nature Conservancy’s Nature in the Urban Century assessment (McDonald et al. 2018). Of the variety of document types (reports, plans, declarations, maps, etc.) in our database, the most comprehensive data so far are on municipal biodiversity reports and plans. 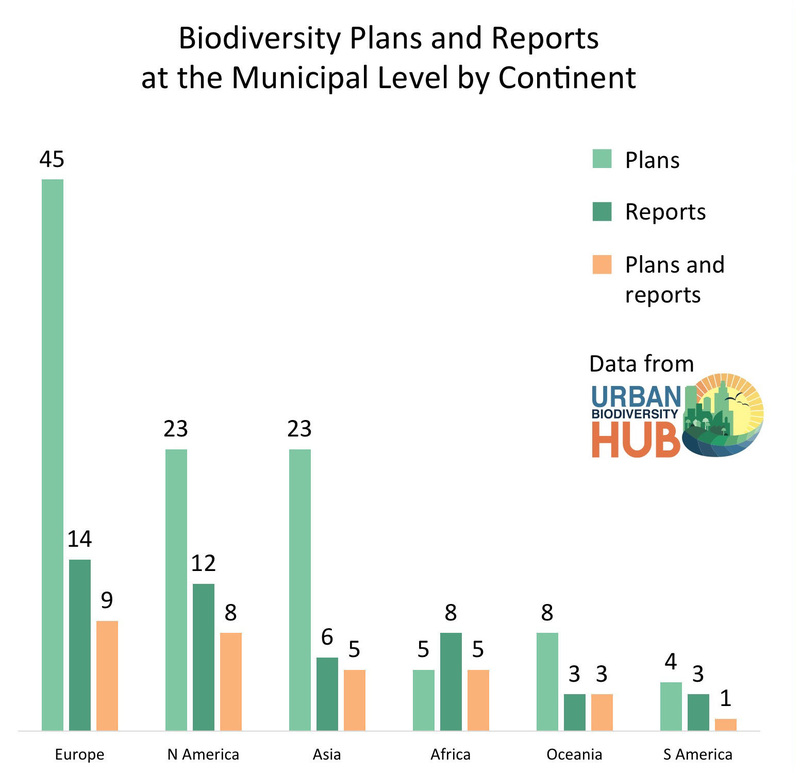 We have identified at least 123 cities from 31 countries that have produced a biodiversity report and/or a biodiversity plan; 108 of these have published biodiversity plans, 46 have published biodiversity reports, and 31 have published both. Cities around the world have taken part, although the majority of documents were produced by cities in Europe, followed by North America and then Asia. Cities of all sizes are planning for biodiversity, from towns with populations of less than 100,000, such as Curridabat, Costa Rica, to megacities such as Shanghai, China. 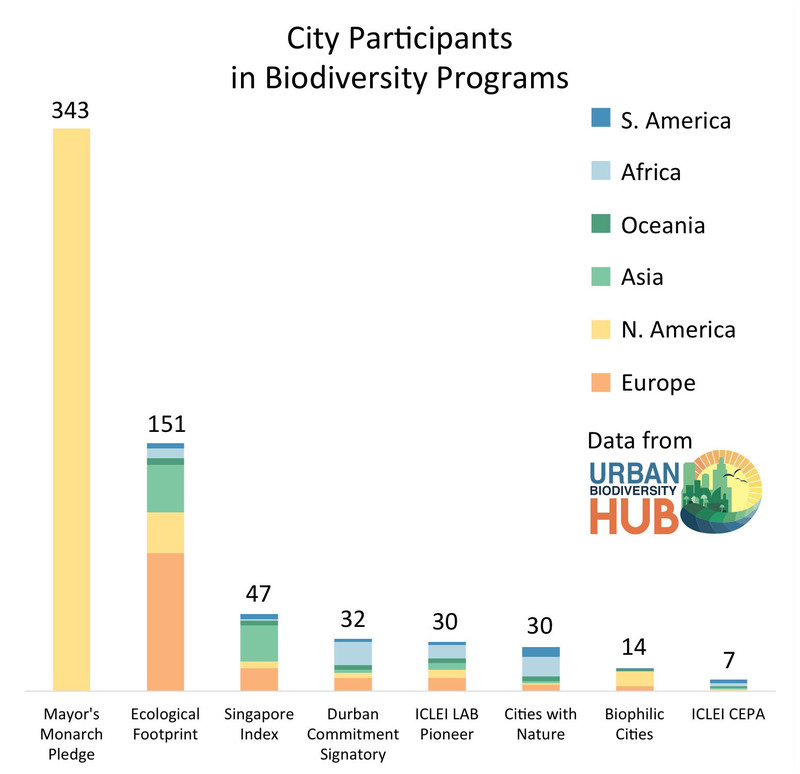 Graph of the number of cities (by continent) that have published urban biodiversity plans and/or reports. A biodiversity plan is an official government document that indicates the intended strategy for biodiversity conservation. A biodiversity report is a document that summarizes the current conditions of biodiversity within a particular area. Data are based on the public database at www.ubhub.org/map and originally produced for McDonald et al. (2018). Another comprehensive data set is a compilation of municipal participants in biodiversity programs. Programs help cities manage or plan for biodiversity by offering a standardized index or series of steps that sometimes comes with institutional support. Examples of such programs include the Singapore Index (also known as the City Biodiversity Index or Singapore Index on Cities’ Biodiversity), the Ecological Footprint, the Biophilic Cities Network and other international programs. We mapped municipal participants in 26 frameworks and programs that are specific to urban biodiversity and are in use in more than one country. Graph of municipalities participating in various international urban biodiversity programs. Note that these data do not include city-states, such as Singapore. Data from www.ubhub.org/map, produced for McDonald et al. (2018). In addition to the map, the UBHub website also includes a guide, which is a collection of resources that are useful for urban biodiversity practitioners. The resources are organized by category and linked back to the original source. Categories include public engagement, regulations, data repositories, conferences, measurement tools, blogs, and more. One feature of the guide is a program comparison to help practitioners make an informed decision about their biodiversity approach by comparing nine systems at once. The comparison includes a basic description of each program, the program steps, participation requirements, and the pros and cons of each. This comparison can help a city more efficiently select a program that is right for them. Practitioners often have little time to research comparable efforts in other cities or compare approaches, and may end up either developing a system on their own or adopting a pre-existing framework without having the opportunity to analyze or even find out about alternatives. With the many numerous urban biodiversity strategies and programs being applied around the globe, it is difficult to discover and select an appropriate program. We hope that this comparison will help practitioners identify the most suitableprogram for their city or community. 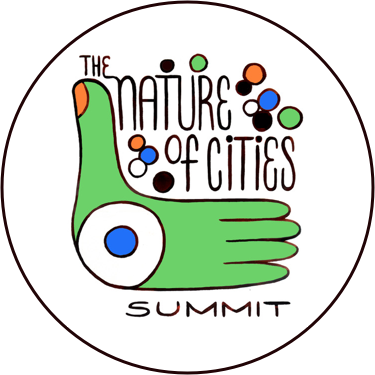 We recognize that capacity and needs vary from region to region and city to city, and that knowledge of urban biodiversity and related topics is spread around the world. We therefore believe that an international exchange of knowledge and resources can bring important insights and offer opportunities for future collaboration. To that end, the UBHub website also includes a dedicated discussion forum accessible to logged-in users. On the forum, users can post or respond to questions and vote up or down on content to ensure quality. Positive votes on a user’s contributions add to the user’s reputation points in recognition of their contribution to the dialogue. We are now developing the myIndicators web platform for cities and their partner organizations to select and manage biodiversity indicators. City representatives will be able to log in, connect to the dashboard for their city, invite collaborators to join their dashboard, select their indicators, and start managing their biodiversity strategy. They may choose from several pre-existing index programs or create their own custom set of indicators. Indicators can include quantitative trends such as the amount of tree canopy cover or number of participants in education programs, or qualitative steps such as approval of a biodiversity plan by city council. The myIndicators dashboard will provide practitioners with a summary of their city’s progress and downloadable reports to use and share. It will also link to the forum, where practitioners can connect with researchers and one another to compare approaches and share techniques. We are working with several cities and NGOs in our beta testing program to refine the myIndicators platform over the upcoming years. These beta testers are leaders in the field of urban biodiversity and pioneers in the measurement and management of urban biodiversity indicators. Ultimately, the myIndicators platform will help cities and communities manage their indicators, track their data, generate reports, and improve the efficiency and effectiveness of their biodiversity planning and management. Collectively, UBHub’s components—the map, guide, forum, and myIndicators—arose as a response to the gaps and bottlenecks in urban biodiversity planning and management. While developing UBHub, we spoke with many researchers and practitioners who told us that urban biodiversity is generally championed by one or a few passionate staff members who take on the city’s biodiversity or conservation-related efforts on top of other responsibilities. We developed UBHub’s components with these practitioners in mind, with the goals ofincreasing the capacity of local governments and their partners to develop biodiversity strategies and of making urban biodiversity resources more widely available. 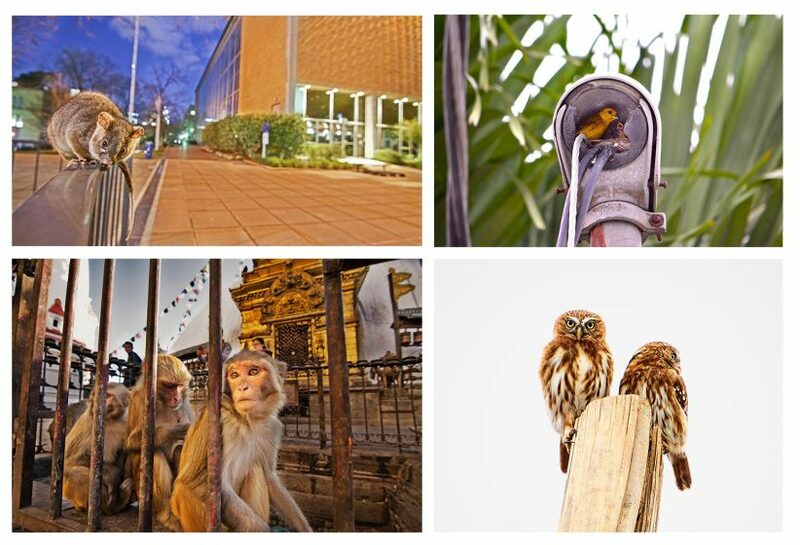 Clockwise from top left: A ringtail possum explores the University of Melbourne, Australia, campus at dawn; the saffron finch is the most common passerine in Guayaquil, Ecuador, and it has adapted its nesting behavior to use human infrastructure; the SwayambhunathTemple in Kathmandu, Nepal, is home to about 400 free-ranging rhesus macaques; the Pacific pygmy owl is one of the most common owls in the urban areas of Guayaquil, where it helps control plague-carrying animals. Photos © JuandeDiosMoralesPhotography (The Wild GYE Initiative). 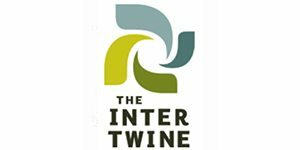 As we move forward in partnership with our beta test cities in developing myIndicators and other tools, we invite interested parties to join us in promoting the value of urban biodiversity and facilitating better urban biodiversity management by adding and using data, as a volunteer, or as an organizational partner. Our team at UBHub originally came together in December of 2016 at the 13th Conference of the Parties of the Convention on Biological Diversity, out of mutual interest in promoting measurable biodiversity actions in cities around the world. We have members in 18 countries who all volunteer their time to create a one-stop shop for current practices in urban biodiversity. Jennifer Rae Pierce heads the Urban Biodiversity Hub’s Partnerships and Engagement team and is a steering committee member. She is a political ecologist and urban biodiversity planner. 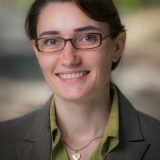 She is currently completing her PhD at the University of British Columbia in Vancouver on the topic of engagement in urban biodiversity planning. By night, Mika Mei Jia Tan leads the Urban Biodiversity Hub’s Steering Committee. 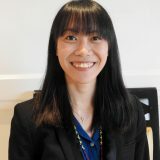 In the day, she is Coordinator of the ASEAN Youth Biodiversity Programme at the Association of Southeast Asian Nations (ASEAN) Biodiversity Centre. An interdisciplinary thinker, she holds a B.A. in Environmental Studies (Conservation Biology) from Middlebury College, USA. Juan de Dios Morales is the founder of the Wild GYE Initiative, which promotes Guayaquil’s biodiversity through photography. 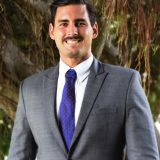 He has worked on different aspects of environmental management, communication, and education and is knowledgeable on ecological research, environmental policy and planning strategies, and project management. He has dedicated more than 8 years to nature photography and become an environmental communication leader. Melissa A. Barton heads the Urban Biodiversity Hub’s Research and Development team. Her current research focuses on nature-based solutions and urban biodiversity. 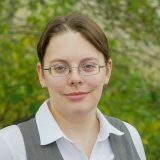 She holds an MSc degree in Environmental Science, Policy and Management from a joint program with Lund University, Central European University, and the University of Manchester.